Anyway, what’s the difference between the Exposure slider and the Brightness slider (both in the Basic panel as well as the Adjustment Brush)? They both have the effect of brightening the photo right? The main difference I’ve found is that Exposure really targets the brightest parts of your photo and makes them brighter. Almost to the point of over-exposure. And it does so pretty quickly as you increase (or decrease) the slider. Brightness on the other hand still brightens the overall photo but does it more in the mid-tone (middle gray) area. Here’s a view of a simple gradient image I created in Photoshop (By the way – you can download it here if you want to try it out for yourself) with the Highlight warnings turned on. You can see the before/afters and how each slider affects the highlights. If it’s hard to visualize what it’ll do to a photo then check out the lighthouse from a photo of mine. On the left is the result of reducing the Exposure and on the right side is the result of reducing Brightness. Notice that reducing the Exposure almost immediately gets rid of that bright highlight on the very far left side of the lighthouse. Reducing Brightness makes it all darker but keeps the brighter highlight area better. This fits with the whole idea that Exposure attacks the really bright stuff harder than Brightness does. It also has some affect on color. Another similar gradient that I’ve created shows how moving the Exposure slider and the Brightness slider all the way to the left changes the blues, the greens, and even the yellows but in a slightly different way. I usually see this the most when I’m working on the sky and it probably explains why I usually prefer the Brightness slider to darken a sky rather than the Exposure. Personally, I just find that the result looks better (remember, this is totally a personal-taste kinda thing). But they definitely do affect color in a different way. So what’s your take on it? Which one do you use the most and why? Oh yeah, if you want to download the sample gradient images I used then just click here. Thankyou for such an informative post, I’ve only just started using LR and this post is a big help. On top of that, this is the first time I’ve found this site and will read up more on it. matt, you have friends at adobe. why not ask the official answer. is exposure more like the whitepoint on the curve ? but on the 14bit brightness levels of the raw file ? or comparable to brightness. the manual puts exposure as a whitepoint tool. i use exposure, black an fill first. then brightness and cntrast if nly little adjustment s needed. for more contrast work i set exposure and a little black and then go th PS for curves, because i like PS curves over the lightroom curve panels. i have a question though. should i leave the brightness at default +50 ? and the adjust ? i now have it default to 0 ( same with contrast) and adjust when needed. still havent seen a clear answer for that. seems like a good reason to upgrade. I have found that reducing exposure and adjusting the brightness on backlit photos really helps – for example, it will pop out the color of backlit autumn leaves without trashing contrast. 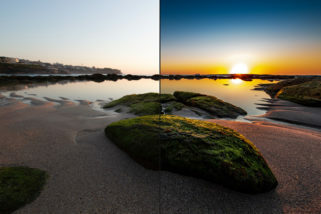 I found this very informative, it’s an issue I have often experimented with, quite often I will reduce the exposure and at the same time increase the exposure to improve the overall ohoto. Really well explained with those images. Thanks for all the hard work you put in on this. “Exposure” sets the white point. “Blacks” set the black point. Great post, Matt, and fabulous comments, y’all! I have wondered about that color shift a few times and this helps give me some understanding on how best to deal with it, while getting the maximum the file is capable of. That’s very helpful study, absolutely!!! Thank you. when I open a RAW file (Canon CR2) in Develop module the brightness and contrast are set to default at respectively +50 and +25. Even if I change these and then double click on “brightness” and “contrast”, they come back to +50 and +25. The weird thing comes when I go to Library module and double click on “brightness” and “contrast” – that resets both sliders to 0 (you now can see both zeroed in Develop module). So what are the base values for contrast and brightness in RAW files – +50 and +25; or 0 and 0. Prior to watching a video where you increased the brightness to brighten an image, I had always just used exposure, but now I tend to lean toward the brightness slider, especially w/ the brush tool. Thanks for all the tips! I included the first image in this post to answer a question on photo.stackexchange.com (see http://bit.ly/dpFLJD). I also included a link to this page since you obviously hold the credit for providing us with this great information. If you don’t agree with me using the image I will remove it. There’s a very straightforward explanation … And if you open an image or create a grayscale with a histogram that looks has lots of space on the left and right with all the gray spiked in the middle you can see it clearly. Like an upside down U. When you adjust exposure to the left or right it will march the histogram right off the left or right edges. It looks pretty linear. The bits drop right off. When you adjust brightness it crashes the values up on the left or right side and doesn’t run them off the chart – so it has the effect of retaining or protecting the bright or dark values. Thanks for passing on the Brightness tip. Went and adjusted last photo shoot and there certainly is a nice difference. Awesome write up – I was thinking about this the other day so I’m glad to have found this post. I found this a valuable tip. Now that I understand the difference, I have started using the brightness function over the exposure slider more often and with good results. Thanks! Incredible article – Excellent demostration pictures – this is the type and caliber of article I am a member of NAPP to read. Exposure and Brightness can be used to create a highlight recovery effect (just like the Recovery slider in the Basic panel) in the Adjustment Brush, which allows the selective recovery of blown-out areas without destroying the rest of the image. Feel free to try this with the sliders in the Basic panel to see the effect, which to my eyes is exactly like Recovery. Now, try it in the Adjustment Brush. For a mild highlight recovery try -0.50 Exposure / +25 Brightness. For even more blown out highlights just decrease Exposure and increase Brightness. I find this method tops out at about -2.00 Exposure / +100 Brightness when it begins to visibly darken the area that is brushed. The great thing about using this technique versus the Recovery slider is that it’s selective, so colors and contrast in the rest of the image won’t be affected. Thanks for the great tips always. Hope this helps some folks. This tip is fantastic! I appreciate your input on the topic. This is great and works wonders. Thanks to both Matt and Page for these great tips! Awesome examples, I had to look a few times to catch the differences. This will help me choose when I get stuck between exposure and brightness! I’ve always wondered what the difference was. Now I can use them with slightly less stabbing in the dark. On another point has anyone else notice a bug with the colour noise reduction feature in LR3? If I have a preset that makes an adjustment to colour noise and the photo is in black and white mode the slider doesn’t change. Also if I’m making an adjustment to colour noise and have auto sync on all any other photos in black and white mode will revert back to colour. Of course now they have renamed Shadow to Blacks. Exposure contracts/expands the tonal range from the highlight side, and allows clipping. Blacks does the same from the shadow side. Brightness contracts/expands the tonal range from the middle, and compresses the tonal range near the ends of the histogram rather than allow too much clipping. I think that Scott Kramer (and Robert Peter Westphal) gave the correct definition of the two functions. Using the Brightness setting is like putting a semi-transparent white layer on the whole image. Try playing the slide to the max value to see the effect. The exposure slide changes the image in a different way, as Scott rightly pointed out, shifting the white point without “washing out” the image. So, to recover a dark image is better to work with Exposure. When the details in the image pops out, than you can adjust the Brightness. I adjust exposure and brightness for two different purposes. It’s easy to mix up how they operate as they seemingly function similarly, but their net output is different as you’ve shown. As to what the difference is requires and understanding of the attributes of light (lightness, saturation and hue). Brightness impacts not just the lightness of an image (that being what we detect the easiest between the two adjustment settings), but better preserves hues (colors) as they’re mapped across the color spectrum. The greater the brightness the greater the intensity of the color. As your diagrams show as the brightness increases the relative color relationships are preserved. The same is not true of exposure. As I see it exposure will brighten an image while not keeping uniformity of hues (colors) as consistent. Exposure relates most to lightness and is best suited to adjustments impacting dark and light attributes of an image. I use Exposure adjustments to set my black and white points. I use Brightness to preserve color relationships when lightening/darkening an image. I watched a Video on Luminous-Landscape with an interview with Thomas Knoll and some other guys from Adobe. Basically he said, he first adjusts the black and white points using “exposure” and “black”, and then adjusts the overall brightness of the image with the brightness slider to his liking. Some good feedback here. There is an obvious reason why Adobe put their adjustments in the order they do. I tab my way through them all with cmd j on. There is a very good reason for getting it right in the camera. Does anyone still use a hand held light metre. These will usually prevent the devil of over exposure. Beware of Highlight recovery, it can kill colour and contrast. Solid post, and very informative. I don’t know why but I always stayed away from the brightness slider for some reason and strictly used exposure for this type of adjustment. thanks. I find myself underexposing by about 1/4 then hitting the exposure till it pops then hit the black slider and sometimes the brightness for skin tone. When I over expose I sometime get this waxy looking skin on white folks thats hard to get rid of. Really white folks give me fits. Would love to hear what others use, Great post and great comments. Im going to try some of these. No doubt a calibrated profile is the best way to go. I tend to think my camera underexposes so sometimes I’ll shoot with an adjustment of +.3. In the days of film we would run a test roll before an important shoot. In addition we would have a few clips pushed a 1/4 and 1/2 stop just to see what happens. It’s like testing the true speed of the film. Often we would select a 1/4 stop push as it kicked in just enough. That’s the way I look at the Exposure slider. As the guys above seem to agree, it expands the histogram and and the brightness adjusts the mid tones. Matt got me interested so I had to investigate. I made an 11-step grayscale step wedge in Photoshop and imported it to Lightroom 3. Then I changed exposure and brightness in four steps (exposure +0.5, +1, +1.5, +2, brightness 38, 75, 113, 150) and exported the resulting files as TIFs. It seems that the two sliders work very similarly for shadows and midtones, but the brightness slider refuses to blow out highlights. Even at brightness +150, source RGB value of 230 (90%) will be adjusted to 254, not full white 255. PS. The source file was a sRGB bitmap. Your graphs explains a lot. I finally think I understand the difference between the two. I agree with Wes and Scott above. I’d set the Exposure to expand the histogram to improve the tonal range. With my finger on the Alt key I hike up the exposure until the clipping kicks in. Then adjust the Brightness to improve the overall feel of the image. No one’s mentioned Recovery! This can, to some extent counter the effects of Exposure, but only at the very brightest levels. Another way I use Exposure is to overexpose in the camera by 1/2 a stop then reduce the Exposure by 0.5 in LR via my default import settings (the Exposure scale in LR equates to in-camera exposure values) . Why do I do that? To push more of the data into the higher end of the exposure range where there is more bit depth. More bit depth means less chances of noise in the shadows or banding once you start trying to rescue shadow detail. Yay, Matt!! The answer I’ve been looking for since LR1!! Thank You!! Great topic to post. I’ve been with lightroom since the first beta and use it for a fine art wedding workflow of 50 weddings plus other sessions each year. The way I’ve come to understand the difference is along the lines of what Robert and Scott have already said but in other terms. The exposure will move the entire histogram left and right, completely off the highlight border of the histogram right if you let it. It tends not to let the black point slide off the histogram left though. In effect what exposure controls is your highlight clipping point. I always start with exposure to bring the bright highlights into control and show highlight detail because there is often information on the histogram right that was recorded but invisible. I slide exposure to get as much data that was shot in between those histogram borders. My next step is using fill and brightness to get my mids looking healthy. A tone curve will finish it off nicely to bring dimension back in if it’s looking too flat. I don’t use recovery for highlights due to the color shifting that tends to occur. Brightness side notes: With my Canon files and the Faithful Camera Calibration a default brightness of 40, down from adobe’s 50, tends to most closely match my camera generated jpeg preview. Thanks Matt for the tip. Much appreciated! Terrific tip. I’ve often struggled with Exposure-vs-Brightness and as RLA10 said, found that although each worked well in certain circumstances I didn’t for a moment understand WHY. Other blog references to this topic seemed to tiptoe around it without giving clear explanation or leaving the reader any better off *. As always, LR Killer Tips cuts through all the mystery with useful no-nonsense text and…examples! You rock, Matt! Here’s my take. Exposure sets the white point, or what I call bright point. Exposure should be used first to get the basic white point set. Then comes brightness. What brightness does is brighten overall bright tones without moving the white point. Or, as you pointed out, mainly affects midtones. If you move brightness slider enough, it will of course affect white point eventually, but it really tries to maintain and hold your white point set with exposure. I usually will work top down and set exposure, then brightness and then maybe highlight recovery for specular highlights or other areas that need more detail. Thanks again for another informative article! I’ve always tended to adjust the exposure setting in combination with recovery rather than brightness. Thanks for the info and insightful illustrations. This was terrific. I have always tried both ways picking the one that looked best to me, but never understood why. I’ll continue doing the same, but now I know what I’m looking for. Thanks for the gradient images to play with. Question one (a slight aside): When I tried to open the top two files in the zip file (the ones listed as OS-X) I got a message that Photoshop couldn’t open them due to an unrecognized marker. I am on a PC. They both have a JPG extension and I thought JPG was JPG. Does Mac have its own version of JPG? I always read your tips an suggestions but this type of tip/suggestion is great … how about some more along this same vein? Thanks for a great tip Matt. I’ve never understood what the difference was. I’ve always used the exposure slider but that seems to end up turning the highlights into midtones and washing them out as a murky grey (shown to some extent in your photo above). The brightness slider seems to do a great job in keeping contrast to the highlights. Thanks Matt, you’re definitely right. My point is: that said, what Exposure slider’s for? Do u suggest it for any specific purpose? it is pretty easy to understand. With the exposure slider, you stretch the tone-values until the histogram reaches the right border and the amount of tonelevel is at it’s maximum, and with brightness, you set the brightness of the picture you want. Great post! Really informative. I tend to first make sure my exposure is set right and after that I might increase the brightness a little if the picture gets to dark. I heard a lot about brightness vs exposure but never heard anyone talking sense. The info above is still interesting, as the effect there is not exaggerated, like in other tests. I personally prefer Exposure in most cases  instead of default Brightness +50 and Contrast +25 which I leave zeroed. I like the result by increasing exposure a bit  noise won’t become so evident though the contrast either remains the same or also is increased, compared to the initial look. As for the contrast, I prefer the curve to the contrast slider which I leave intact. Thanks for this topic, Matt. Very helpful. I have nvever given the distinction between the two sliders much thought. I almost exclusively use the exposure slider but can now see where brightness could be a better choice in some circumstances. Since I do a fair amount of black and white conversion, I’ll need to see if the distinction is as eviden with B&W. Any thoughts? I guess out of the two I use the Exposure Slider the most and yeah I agree, jus the slightest of adjustments makes quite a difference. That combined with the Recovery Slider are definite winners for me. I like exposure best and only add brightness as a last result after adjusting exposure. I find it to be a way to help a way under exposure shot ( 1 1/2 stop or more ) . Actually…you know in Adobe Flash, if you want to make an app that brightens the image, you would use three commands to boost the levels of red, green, blue individually which results in a brightening effect…so that’s what I think really happens.. Try reducing the amount of recovery, and then go into the HSL panel and tweek the sliders for the color you want to fix, you just gotta play and you will get better at LR. As for your filtering, try also using collections. You can still filter by rating ect. , but if you create a collection and then right click on it and set as target collection, you can add the photos you have rated (lets say as best/edited or whatever) to the “target collection”. Then you can go to that collection and see only those. As an example, I have a shoot I imported named “July 4th Fireworks 2010”. That import contains all the photos taken. But I also have a collection named “July 4th Fireworks 2010 EDITED”. That contains only the shots I selected as the best. You can also choose if you want to have lightroom create virtual copies when you add to the collection or not. I personally don’t. THANKS RON ..i will try that with de HSL ………..I just thoought there would be an easier way to do it like the WB slider slidinge in a specific colour but seems to be a common issue:!! VERY HEPLFUL THANKS A LOT!!! Yup, I found a similar problem with LR3. I used to crank up the recovery slider to recover the blown-out highlight (usually after increasing exposure/brightness). However, with LR3 seems that the recovery slider is now more sensitive to the color shift. Even a slight increase will results in more red/magenta in the color (on the skin tone especially). Will try to use the HSL as suggested, it may help to neutralize it. I appreciate every singel TIP you POST always checking weekly /dayly…. ANY IDEAS !HOW to ACHIEVE IT!!! Thanks Matt, but I think you’ve missed a diagram. here’s the original, here’s the highlight warning, here’s with exposure +4, here’s with brightness +4? I think you have a typo, Matt! In the B&W gradient circle both results are marked as “Exposure”. I was thinking about the difference between these two for quite a while. I think that vignetting is better done by Brightness. Since it preserves highlights better the result is more like Burn tool in PS. Thanks a lot, I always wondered what the difference is. Super informative & interesting. Thanks for this.